Deeply embedded within the green mountains of New Corella in Davao del Norte lies Panas Falls - a majestic beauty of nature teeming with unspoiled streams of multi-tiered watercourses and cool natural springs that cascade freely into a soothing drop of waterfalls gushing mightily into a crystal-clear catch basin of icy waters surrounded by a lush greenery of floras and faunas and a verdant canopy of fully grown forest trees which serve as a natural shade from the searing heat of the Sun, perfect for a cool leisurely dip particularly in the hot summer months. The site is a widely popular summer destination in the province and is frequented by locals and regularly visited by domestic travelers and foreign tourist for river trekking and water adventure. While the Falls and the area that surrounds it remain underdeveloped, Panas has drawn a strong following of nature lovers and outdoor buffs from nearby towns and cities because of the Falls' natural beauty and the many eco-tourism adventures it offers to its visitors. It is nestled in a forest protected area of Barangay Carcor, managed by the municipal government of New Corella. Because of its popularity, Panas Falls has almost become synonymous to New Corella and is considered one of the widely visited and most important eco- tourism attraction in Davao Del Norte. 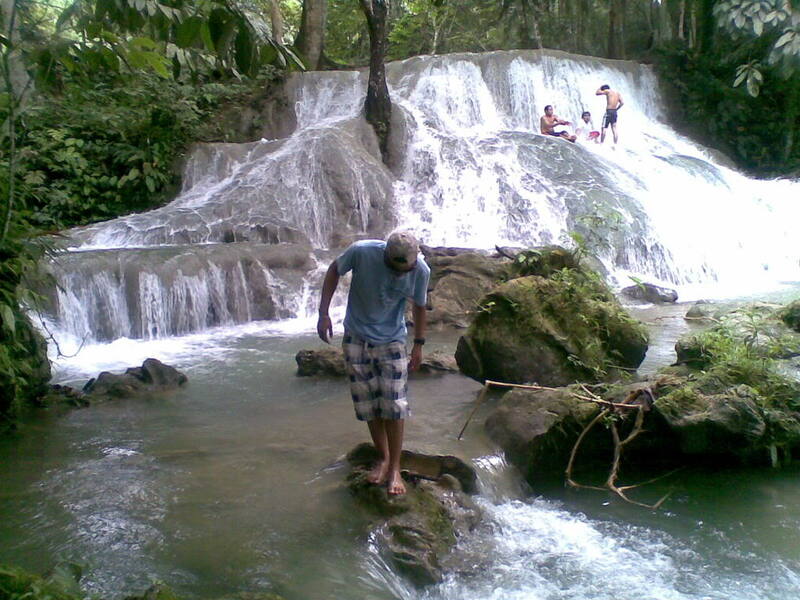 Panas Falls is situated at, and is part of Barangay Carcor in New Corella, Davao del Norte. The site is approximately four kilometers or about 30 minutes drive of mostly bumpy rough roads through the scenic stretch of the countryside from the town proper of New Corella. From Davao City, there are buses at the Davao City Overland Transport Terminal (DCOTT) in Ecoland that regularly ply to and from Tagum City, the capital town of Davao del Norte, where several jeepneys bound to and from New Corella are stationed at the Pereyhas Terminal near the Tagum City Overland Transport Integrated Terminal (TCOTIT). At New Corella town proper, there are habal-habal that regularly service visitors for a minimal fee to the site. Davao City to Tagum is about two hour bus ride.